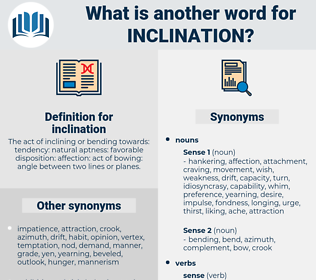 What is another word for inclination? The act of inclining or bending towards: tendency: natural aptness: favorable disposition: affection: act of bowing: angle between two lines or planes. desire, taste, disposition, intent, bias, mile, gradient, attitude, envy, susceptibility, yearning. propensity, intention, orientation, vocation, incline, temptation, trend, steepness, willingness, tilt, appetite, preference, kneeling, slope, heel, fondness, pitch, Tilting, readiness. fairness, inability, hatred, disbelief, hate, antipathy, repulsion, disgust. hanging, distaste, negligence, insouciance, objectivity, purposelessness, impartiality, receding, declination, thoughtlessness, dislike, aversion, allergy, aimlessness, nonchalance, avoidance, heedlessness, carelessness, indifference, apathy, neglect, disfavor, unconcern, Disrelish, oversight. They were too far apart to identify each other, but neither showed any inclination to approach nearer. Have I ever shown a decided inclination that way? drift, disapproval, set, denominationalism, direction, movement, literalism, favouritism, propensity, favoritism, bent, devices, disfavor, call, perseveration, partisanship, sympathy, proclivity, disfavour, impartiality, nonpartisanship, understanding, predisposition, partiality, dislike, favour, favor, leaning, trend. leaning, propensity, undertow, tendency, stomach.